There’s journey, and then there is adventure. China is becoming so popular for its modern wonders of technology and architecture, but what about adventure buffs who want to experience some real Goonies style adventure? When it comes to international travel, some people like to take vacations while others enjoy a good journey but for the more tenacious sort, adventures are where it’s at. Real life adventures, just like the stuff of popular 1980s films’ the Goonies or Indiana Jones. But real. And you. And your hat is different because no one wears those anymore. The kind of adventures you’re looking for aren’t every travel company’s forte, but rest assured you’ll find some spicy, excellent deals at thechinatravelcompany.co.uk. The ruins of China are many, so we decided to compile a list of our top 3 ancient ruins that span this massive country. There are so many places to choose from, it wasn’t easy. It really, really wasn’t. In fact, one of us added that we should say these are in no specific order. So without further adieu, for your reading pleasure we bring you our favourite, and quite possibly the best ancient ruins of China. Northeast China’s Shandong Province has long been a historically important land within China, known popularly for being the birthplace of Confucius and also the place where he is entombed. Confucius was born in Qufu back in 551 BC, and died and was buried beside the Si River in 479 BC. Not too soon after Confucius passed away was a temple erected in his honour, which has since been subject to a large number of remodels in the centuries since. The site is adjacent to other relics and manuscripts, situated in the Kong Family Mansion complex. The Han Yang Ling Mausoleum is the location where Emperor Jing of first century BC is buried. The emperor, named Liu Qi at birth, was the sixth emperor of China’s Han Dynasty. The history books state that Qi ruled the region from 157 BC to 141 BC, and that he was a great guy by modern standards. The man cut taxes in half and reduced criminal penalties more than once. That’s the stuff of legends. The site features many of the original artefacts, namely a more petite version of the Xi’an terracotta warrior collection, and the ability to view burial pits through glass panel floors. Located in north-west China, the Xinjiang region is home to the Jiaohe Ruins and an eclectic cultural mixing pot of Uyghur, Han, Kazakh, Tajik, Hui, Kyrgyz, and Mongol ethnicities. Situated in the Yarnaz Valley 10 kilometers west of Turpan, the Jiaohe Ruins consist of a natural fortress on top of a steep hill on a plateau between two deep river valleys. It was abandoned after a Mongol invasion led by Genghis Khan back in the 13th century. It’s an epic sight to see, and one that certainly should not be missed. The site has been undergoing restoration on and off since 1992, and it continues to be a popular destination with China travellers. 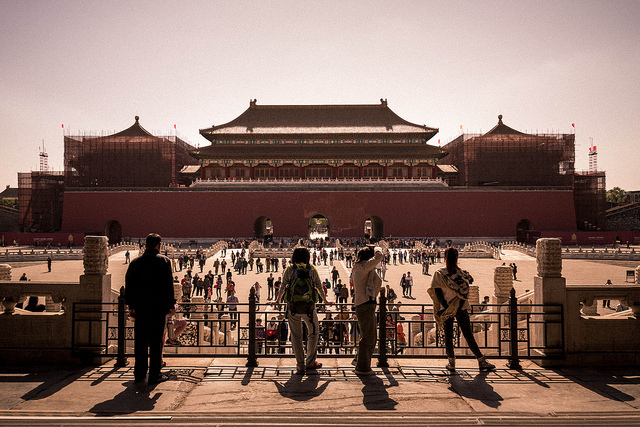 The sites listed below are just some of the many historical places you can visit in China. If you have a partner and you’re both feeling a little bit daring, you can even plan your honeymoon in China with The China Travel Company and book your tour to visit one of these places. Or better yet, bring along your friends with you for a more exciting trip. Who knows what else you might discover along the way. Got any more suggestions on other sites to visit? Let us know in the comments!